Ruud Gullit in World Cup 1990. At the age of 16, Gullit began his senior career at HFC Haarlem. After three promising seasons in which Gullit scored 32 goals in 91 games, he moved to Feyenoord in 1982. Once there, he got to play a full season with Johan Cruyff, which left a lasting impression on the young Gullit. Unsurprisingly, that was also his breakout season; in addition to helping Feyenoord win the Eredivisie, Gullit was voted Dutch Footballer of the Year. In 1985, Gullit moved to PSV Eindhoven, which saw him come under criticism from Feyenoord fans. 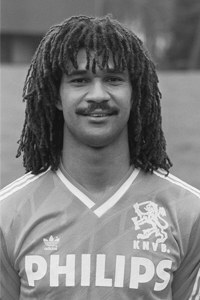 Despite the increasing pressure, Gullit continued to improve as a player, which saw him being named Dutch Footballer of the year again in 1986. Gullit won the Eredivisie title in both of his seasons with PSV, scoring 46 times in 68 appearances. By 1987, it was clear that Gullit had outgrown the Dutch league. The same year, he moved to AC Milan for a then-world record fee of €6.75 million. In doing so, he joined his compatriots Frank Rijkaard and Marco van Basten, forming the “big three” that would dominate Italian and European football in the coming years. In his first season with the club, Gullit helped Milan win their first Scudetto in 9 years. For his achievements, he won the 1987 Ballon d’Or. In 1988, Gullit led the Netherlands to their first UEFA Euro title. This ended the streak of disappointing results for the Dutch, who had failed to qualify for the previous two World Cups. By then, Gullit was the team’s captain and the main driving force alongside Rijkaard and Van Basten. In the final match, Gullit put the Netherlands in the lead with a header goal, with Van Basten scoring an exquisite volley to put the game away for good. Now well into his prime, Gullit led Milan to a European Cup title in 1988. Though a knee injury had sidelined him for much of the following year, he still managed to recover in time for the 1989 European Cup final, where he helped Milan win their second straight European Cup. Slowly but surely, however, Gullit was starting to be phased out of the team. Milan won two more Serie A titles in 1992 and 1993, but Gullit’s contribution was a minor one. After being loaned to Sampdoria in 1994, Gullit reminded the football world that he still had what it takes by scoring 15 goals in 31 appearances. Though the Milan brass was initially impressed with his showing, things didn’t work out and Gullit soon returned to Sampdoria for another season. For the final pit-stop in his playing career, Gullit decided to move to Chelsea. 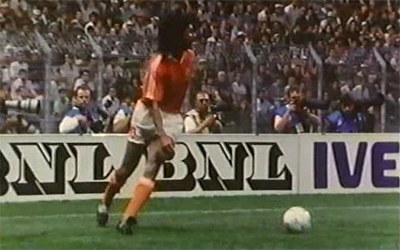 Though he was initially played as a sweeper, Gullit soon moved to his preferred midfield role. During the final two years of his playing career, Gullit assumed the role of player-manager. Thanks to his eye-catching style and demeanor, Gullit played a big part in the “foreign revolution” which saw many international stars join the Premier League.